Irish painter Jack B. Yeats was born in London and grew up in Sligo with his maternal grandparents before returning to London in 1887 to live with his parents. He briefly attended the Government School of Design and the Westminster School of Art and went onto work as an illustrator for sporting periodicals and newspapers. A visit to the West of Ireland in 1898 inspired his first solo exhibition 'Sketches of Life in the West of Ireland'. It would remain his theme for much of his artistic career. 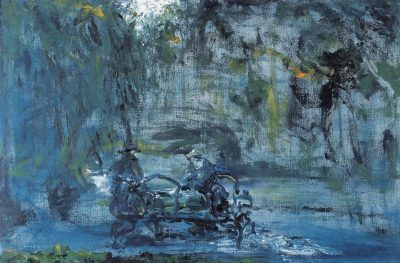 Irish painter Jack Butler Yeats was born in London and grew up in Sligo with his maternal grandparents before returning to London in 1887 to live with his parents. He briefly attended the Government School of Design and the Westminster School of Art and went on to work as an illustrator for sporting periodicals and newspapers. A visit to the west of Ireland in 1898 inspired his first solo exhibition Sketches of Life in the West of Ireland. It would remain his theme for much of his artistic career. By 1910 he had moved permanently to Ireland, living in Greystones, Co. Wicklow and later Dublin. Yeats was elected a member of the Royal Hibernian Academy in 1916. His painting The Liffey Swim won a silver medal at the 1924 Olympic Games in Paris. The broad fluid brushstrokes of that work mark the change in his technique during the 1920’s, from that decade his work became more expressive and experimental. Yeats’ work is held in numerous national collections including IMMA, the National Gallery of Ireland, Dublin City Gallery The Hugh Lane, Crawford Art Gallery and the Model, Sligo.